Hello! My name is Jazzy, and I am the sweetest and most affectionate girl you will ever meet! I was abused and beaten by my first owner. I was taken in by a rescue group and lived in a foster home for a year before being adopted by my current family. I did not trust men until I had lived with my current owners for several months. I was never aggressive, but cowered when they tried to pet me. Now I am fine with men and women as well as children. I have been with my current owners for the past three years. Given my early trauma, you might be surprised to hear it, but truth be told, I am as affectionate as a dog can be! I am so sweet and loving and friendly and affectionate now that I have recovered from my early abusive life! I LOVE giving and getting love! I LOVE snuggling on people’s laps or lying by their feet if they prefer! I love hugs and I love to be petted and I don’t mind when children or adults hug me, as long as I know them and it’s not too tight! I also love belly rubs!! I am so social that I am most content when lying in the same room right next to my owner, though I also love to lie outside in the backyard and watch for birds and small animals! I love to be silly and roll on the carpet and kick my legs up in the air! My owners do not tend to let me on furniture, but I am happiest when on the furniture with my people! I am also happy to report that despite my traumatic early life, I am now an enthusiastic and energetic girl who is full of confidence! Talk about happy progress! 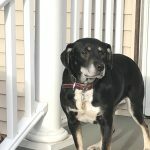 Between me and the other dog I have lived with for the past three years, I am the outgoing one who will rush through the doggy door to see what’s outside or will run up in a super friendly way to greet a stranger while wagging my tail! I have gotten much better about not jumping on people, and never jump on small children, but do tend to lick their faces! I am very smart and highly trainable! I love to work on basic obedience and I am quite food motivated so training with treats is the best way to work with me! I have not taken any formal obedience classes, but my owners have worked on the following commands with me with success: sit, wait, stay, off (to get off people or furniture), go lie down, and walk nicely on a leash. I get excited about training sessions and I am eager to learn more! My favorite food is cheese and I also love peanut butter, just FYI! I get a little claustrophobic in a crate, so do better behind a gate in a doggy proof room when owners are not home. I need to be able to move around, so this works much better for us all. 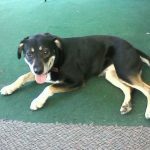 I am a hound mix and love to “talk,” but I am not too loud as long as I get my exercise! 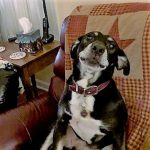 I only bark out of boredom, and once I have gone on a walk or run, (I love to run on a long leash or in a fenced in yard! ), I am content to lie quietly at your feet. I have learned to like riding in the car, but sometimes need to be lifted in. I am fine once in the car and usually lie down during the ride. My favorite place to go is any place not too near cars, traffic makes me a bit nervous, so places like the river or in the country or a quiet park are great for me. I walk well on a leash and do not pull, which I am told is quite a feat for a Lab or a Hound and I am both! I love people of all sizes and ages and I have never been aggressive towards anyone! My favorite person in my current home is a three year old boy. If allowed, I would sleep with him on his toddler bed! I am not allowed upstairs during the day, but I come upstairs on my own each night to say goodnight to him. I love other dogs! 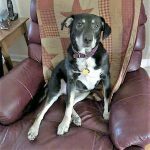 I am calm when walking past other dogs when I am on a leash but sometimes whine a little if I can’t go say “Hi.” I am great with dogs while on a leash or off leash at a doggy daycare. I get excited when I see other dogs and want to play with them! I live with cats in my current home and also did in the previous home where I was fostered, and I am terrific with them. I like sniffing noses with them and I am gentle with them. Late at night, I sometimes chase them (in a playful way) but will stop if told to. Going for walks in the countryside! Snuggling and cuddling with my people! Meeting new people who want to pet me! Lounging on furniture or a dog bed! Doing basic obedience for treats! Chewing on hard non-edible bones! My owners are looking for a new home for me because I have grown increasingly unhappy and anxious being by myself all day. I do ok in a crate or behind a gate in the main part of the house while they are at work, but I am much happier when at my dog sitter’s house where I can go on the furniture and be with people all day. My owners cannot afford to send me to doggy daycare often enough and are not able to give me enough exercise. 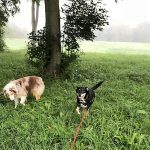 I much prefer to go in a car and go to a rural area to walk on a flexi-leash as opposed to walking in a suburban or urban setting and they do not have the time to do that on a regular basis. The ideal home for me would a home where my owners aren’t gone so much, where we can walk in quiet country settings, and where I was allowed to sleep near them and be close to them. I am in great health! I have clean teeth, a glossy coat, and run like the wind! I have some joint issues and had to have knee surgery on my right hind leg after leaping out of my owner’s car and landing badly on my knee with the leash wrapped around it. 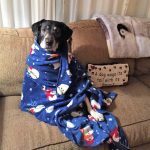 I had the surgery done at Colonial Veterinary Hospital in Ithaca, NY in March, 2018, and made a full recovery. My owners followed through with all the after-care instructions and physical therapy. I had x-rays taken after the surgery, and my knee looks great! I take Dasequin for my joints. I have a heart murmur, but have no health issues from it. I am an enthusiastic, incredibly friendly and loving girl and I am looking for someone who welcomes my energy and has the time to exercise me regularly. I need to be with an owner who can spend lots of time with me and pay lots of attention to me please! I love to lie on people’s laps, and would love to find someone who likes to snuggle with me. I would be happy as the only dog, but would also be happy living with other dogs or cats! I prefer the country to the city, but will do ok in an urban setting if I can take daily walks in the countryside. I love children and would be happiest living with children but would also be happy as long as I have someone who can spend their day with me. I am excellent with other dogs and I adore children of all ages. 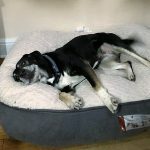 I am a content and happy dog as long as I have someone who is around a bunch, or can provide companionship for me (a dogsitter or doggy daycare) when they are at work. If you are looking for a super affectionate girl that loves to give kisses, I would be a great match for you! If you are interested in adopting me, please fill out an online adoption application and we will forward it to Jazzy’s family. 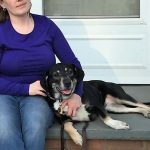 adult, female, good with cats, good with dogs, good with kids, Lab mix, medium. Bookmark.